Another blazing hot and humid weekend. At least this weekend I didn’t have to be outdoors for a bike race. Our new washing machine was delivered Saturday morning and since delivery time was between 8-10 and Bookman had to leave for work at 9:30 and it was going to be hot and humid, I decided to do a hard hour and a half bike workout on the trainer. Even indoors with two fans blowing on me I was hot. The washer was delivered by 9 and after my workout and a shower I went to inspect it and get the two week’s worth of laundry going. Washing machine technology has and has not advanced in the 17 years since my now dead machine. There are only so many ways to wash clothes after all, but this new machine gives me finer control over water temperature and how fast it spins. And even though my old machine said I could fit the comforter from my bed in it, I really couldn’t, but this one it actually fits as advertised! Woo hoo! Ah the joys of laundry. The Dashwoods are free ranging in the chicken garden today but it is so hot they are pretty much keeping to the shade underneath the coop. They are beginning to actually cluck now on a regular and not accidental basis. They are also testing their wings. Both Marianne and Mrs. Dashwood flew across the chicken garden this morning. They can get about 3 feet/1 meter off the ground and can sustain it for about 8 feet/2.5 meters. The fence is 4 feet/1.2 meters high. Will have to watch that and clip their wing feathers if necessary. I hope we don’t have to because catching them and holding out a wing to clip a few feathers will not go over well for anyone involved. Before the Dashwoods got to leave their run this morning I had to take precautions to protect the beans growing in their garden. No fancy wired fencing required, just row cover fabric was enough. An easy solution. And it is a good thing I covered them up because within half an hour they had pretty much chewed up every green thing they could get their beaks on and now I don’t have to weed that part of the garden! It is too bad I can’t let them go into the vegetable garden to do my weeding for me! The plan is after the growing season is over, they will get to spend some time in the main garden. They will like that for sure. 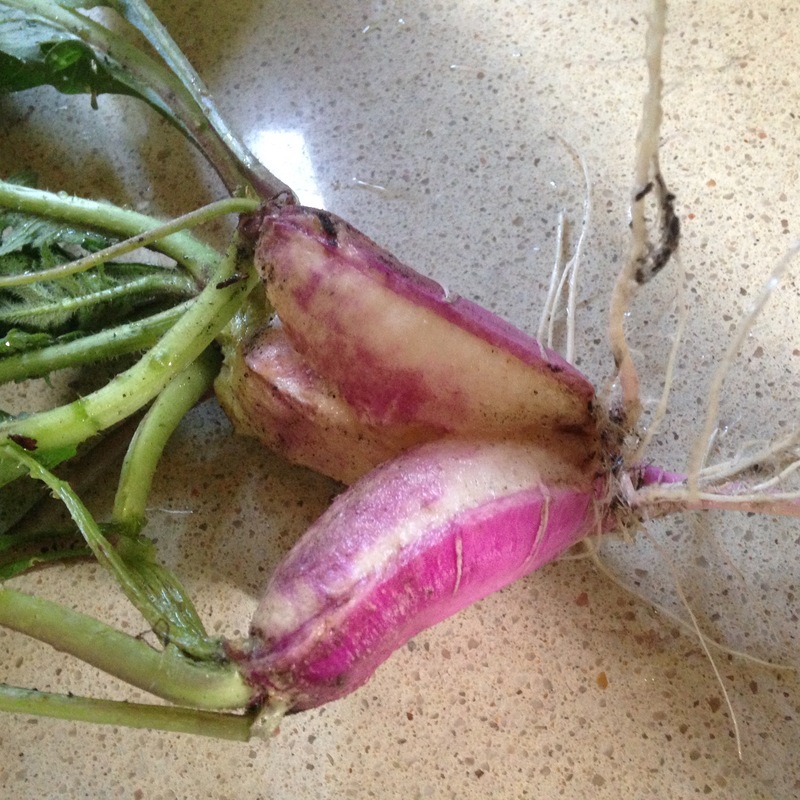 Some of the radishes from last year went to seed and planted themselves and are growing in the garden this year. I pulled one up and it turned out to be a scary mutant! I gave it to the Dashwoods and they scattered with the sky is falling panic. Then they crept back to give it the stink eye. 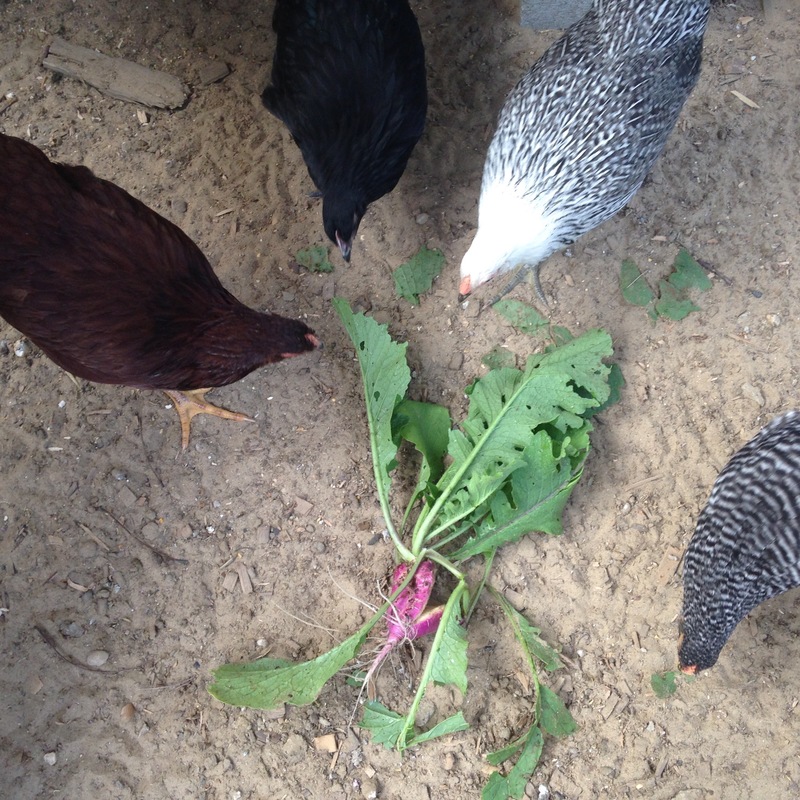 When I tore up some of the leaves and offered them they did not hesitate. They know green leaves from my hands is food. So then they figured out that the mutant thing must be ok and they began ripping up the leaves with verve. The actual radish itself held no interest for them and it is still in their run being ignored as though it were an inedible rock. It will go into the compost bin later. Marianne jumping onto my back has become a thing. She has done it twice more since the first time. I’ll be in the run bent over after the dandelion leaves run out, talking to all of them and she will run up the coop ladder and jump onto my back even if I am not standing right next to the ladder. She is inordinately proud of herself for this move. Mrs. Dashwood does not approve but only because she is jealous. I will attempt to get this on video but I can’t make any guarantees. The coop green roof is doing pretty well. Things are sprouting. I am also learning its microclimate — hot, full sun nearly all day, with the soil drying out from roof peak progressing down to the eaves. So, note for next year, plant the most drought tolerant plants at the top of the roof. I have also learned that when it rains hard, water pools in the roof beds on the lowers edges and then pours off taking soil with it. In an attempt to solve this issue, Bookman this morning drilled drainage holes in the lower edges just above the soil level. It is supposed to thunderstorm tonight so I might get the chance to see if it works. 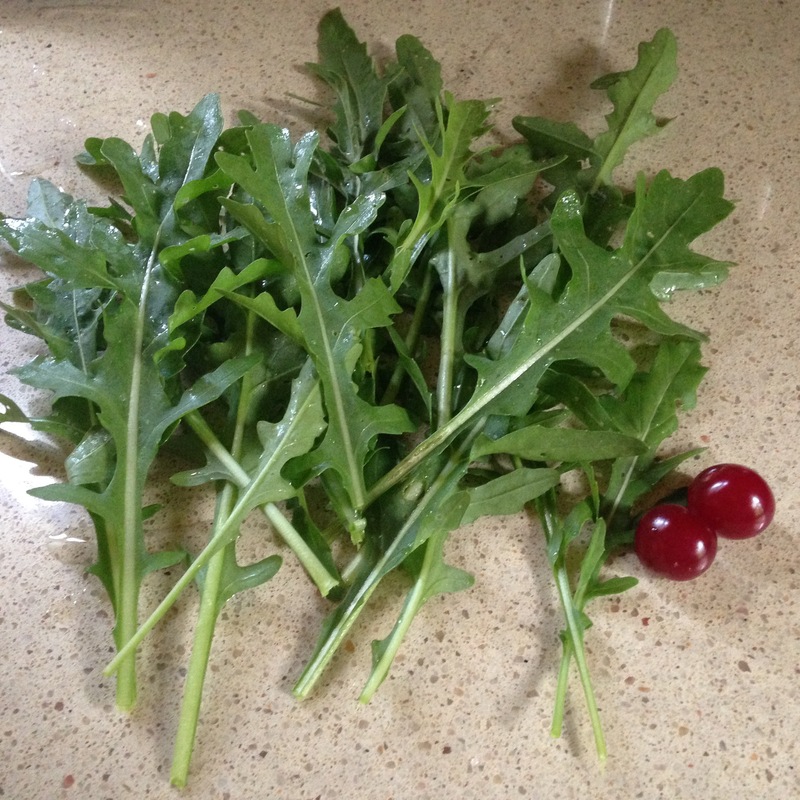 The garden is full of voluntary arugula this year. So very convenient that it took care of planting itself. Unlike the radish, it has not gone mutant. Such a tasty green to add to salads. I think at the end of the season this year I might deliberately sprinkle seeds where I want it to grow next spring. Watch though, none of them will germinate. The cherry tree I planted in the chicken garden this year has given me two cherries! No, one cannot do much with two cherries but the bush cherries are loaded and combined with them, they might amount to something. So they went into a container in the freezer for later. Yesterday Bookman made muffins with the small crop of honeyberries from our two-year-old shrubs. Oh my goodness! So delicious! I might have to find a place to plant another honeyberry bush or two. I’ll have to check how big they end up getting before I go down that road though, I don’t want to end up with the raspberries and the honeyberries taking over the garden. Though that wouldn’t be an especially bad thing. Honeyberries originated in Siberia, so if you have a cool weather climate, I highly recommend growing some for yourself. The potatoes are starting to flower and they had to be mounded up but it seems like everywhere in town is out of straw. Is there a straw shortage for some reason? Of all things. So Bookman had to buy two bags of compost that I used this morning to supplement the straw we already have around them. 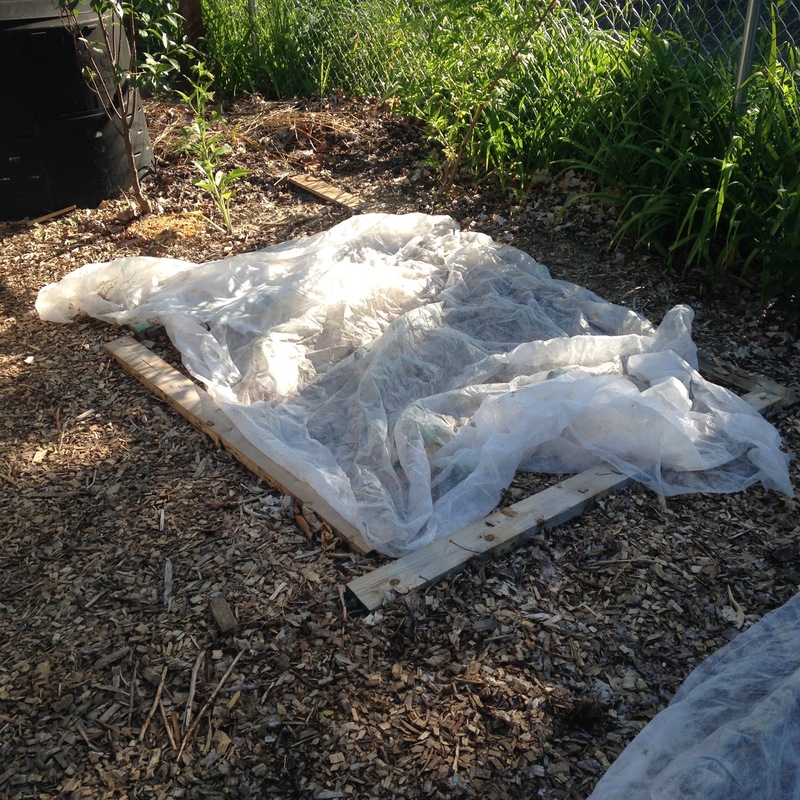 Potatoes have to be mounded in order to protect the the spud from being exposed to sunlight. Sunlight will turn them green and toxic. That wouldn’t do. Hopefully the compost will be good enough for a while until straw becomes available again. I have a really good book from the library called The Rooftop Growing Guide. It is about rooftop farming, so a much larger scale than my green roof. But it isn’t for the green roof aspect that I borrowed it because it talks quite a lot about gardening in containers and has some potentially useful information for anyone with a balcony, rooftop, or limited to no yard space for growing things. I have a big deck from the kitchen/dining area that goes out into the garden and it gets so hot there in summer because it is in direct sunlight nearly all day. The only time it isn’t in direct sunlight is in the evenings when the mosquitoes are out and there is no repellent that will keep those vampires away from the tasty Bookman. He is quite allergic to them too. This means we never sit out on the deck so it is just this big empty space. I keep thinking about container gardening on the deck, herbs maybe but also flowers that aren’t hardy here like dahlias and canna lilies, maybe even bamboo. Growing them in containers would make them easy to lift and store for winter of move indoors in the case of the bamboo. Not sure if I will ever do this, but the book gave me some ideas so you never know! I still have a few remaining unplanted areas in the garden and those will get first priority. Then again, I could start small, one big pot of dahlias or a canna lily. We’ll see how ambitious I feel next spring. I am pleased all is well. I loved the bit about the radish. Anna, glad you enjoyed the radish story! Mutant Radish? ROFL! 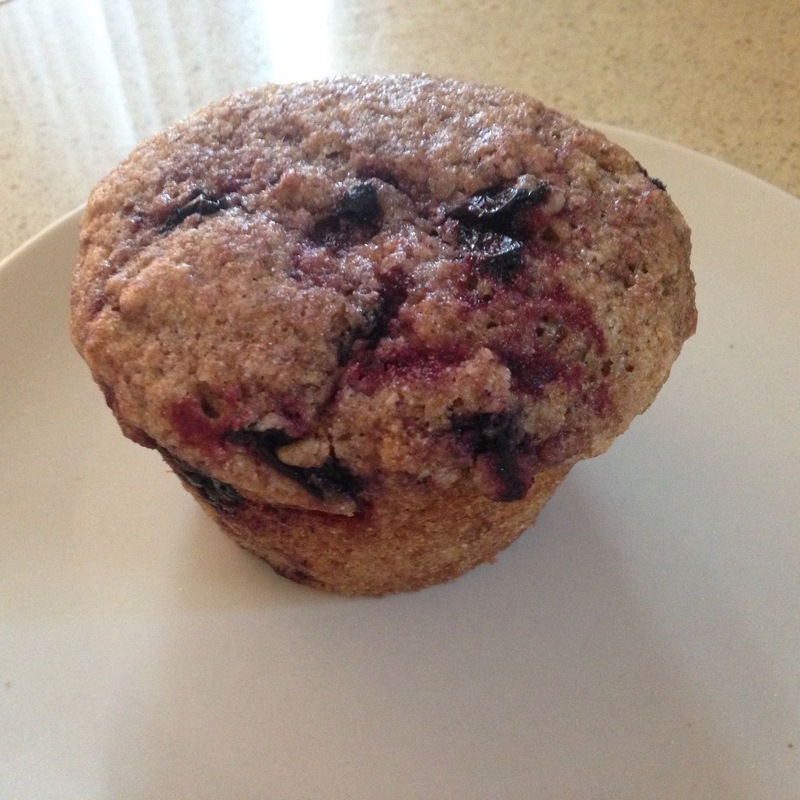 The muffins look delicious….can Bookman share the recipe? Please? I promise to share vegan korma recipe in return!! Congratulations on the washing machine…I completely understand the joys of laundry, especially after they have been piling up for sometime! cirtnecce, It has three crowns so it’s like Siamese triplets. Weirdest radish ever. I will pump Bookman for the recipe not just because I want your vegan korma recipe 🙂 Sometimes it is the things that make household chores easier that bring great happiness. Home grown vegetables are so good both for the stomach and the psyche. Sadly, as my wife and I have a particularly busy season our planting has been minimal this year. Those muffins are making me hungry. I do not think that I have ever had honeyberries. Brian Joseph, oh yes and so much fresher than the store. It is wonderful to walk out into the garden and walk back in with dinner, or at least part of dinner! I totally understand about being too busy to plant much of a garden. Hopefully next spring will bring you more time. Honeyberries are delicious. Kind of tangy sweet. I love your chicken stories. I hope you can get a video of Marianne’s trick. Yesterday at the farmer’s marker, one of the vendors was telling me a chick they hatched imprinted on him. It follows him around, sits on his shoulder, and nestles in his lap when he sits down. I love arugula! I’m so jealous that you have it growing randomly in your garden. Salads, salads, salads!! Joan, that’s so cute about the chick. I don’t think I spent enough time with the Dashwoods to get a solid imprint with them. They come running at the sound of my voice but I think it is just because they are expecting treats. They are friendly but not snugglers and they don’t really care for petting. But that is ok, I have cats who sometimes like to snuggle a little too much. Arugula is fast becoming my favorite green thing 🙂 At the end of the season I am going to make Bookman cook up a huge batch of arugula pesto that we can freeze. Bamboo grows like crazy here. My arugula is not doing well, so I bought some at the market. Today my lunch consisted of arugula, tomatoes and cucumber tossed with homemade creamy Caesar dressing and stuffed into a whole wheat pita. Gosh, it was good. Maybe I should give container gardening another try. We can grow a lot of things year round here, so it isn’t too late in the season I reckon. Grad, I am just far enough north that bamboo is not hardy, though if we keep having winters like this last one it may soon be something I can grow. Watch though, I will dare to plant some and we will be blessed immediately after with a normal winter and my effort will be for nothing. Your lunch sounds like it was tasty! Arugula is so easy to grow and it can be really packed together and doesn’t even need hot sun all day long. Imagining Marianne’s back jumping made me smile. Such a fearless girl – like her fictional namesake! That muffin looks amazing. It’s been far too long since I’ve baked muffins. Laila, Marianne is turning out to be taking after her namesake quite a bit! I love muffins so much it is a good thing Bookman doesn’t make them all the time because my self control would quickly go out the window! Maybe you could construct some sort of pergola above and around your deck then grow things up the wooden posts. You could add movable canvas ‘blinds’ to provide some shade too, that might help with the mosquito problem. Oh now that’s something to think about! Hahaha, oh gosh, if you could get a video of Marianne jumping on your back, I would be so excited. Do you have a favorite Dashwood, can I ask? Or are you not playing favorites? Love how you are already planning for future seasons. And I love the photo of the Dashwoods looking at the radish. They must be such fun. I never thought chooks would be so interesting as personalities.